Biscotti, crisp Italian cookies, come in a variety of flavors. The cookie has a crescent shape and goes well with coffee or tea. Biscotti usually contain bleached flour, egg, shortening, almonds and sugar. Limiting calories from sweets helps with weight maintenance and weight loss. Learning about the calories and fat content of biscotti will help you plan a balanced and heart-healthy diet. Paying attention to calories helps you manage your weight, whether you want to maintain, gain or lose weight. Cutting calories by 500 a day can help you lose 1 lb. a week. 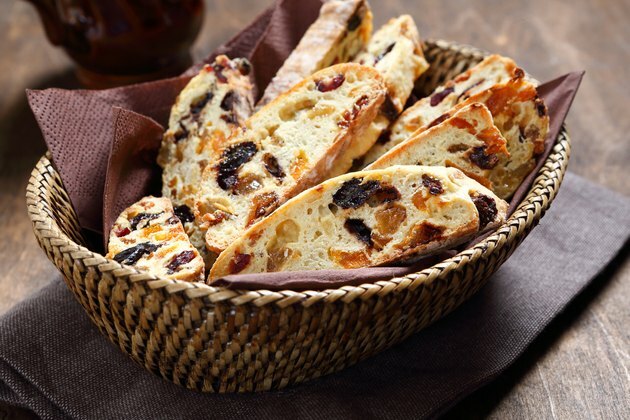 Eating biscotti in moderation offers a relatively low-calorie way to satisfy your sweet tooth. The variety of flavors offers an abundance of treats to choose from, such as almond with anise, chocolate, chocolate and almond and biscotti dipped in chocolate or white chocolate. Biscotti provides 110 calories, 4.5 g of fat, 16 g of carbohydrate, 1 g of fiber and 2 g of protein in one 35 g. cookie, according to LIVESTRONG.COM's MyPlate. Its calories include 36 percent from fat, 61 percent from carbohydrates and 7 percent protein. Specialty and homemade biscotti can contain higher calories and fat. Biscotti contains 20 mg of cholesterol, 70 mg of sodium and 9 g of sugar. Of its 4.5 g of fat, biscotti contains 2 g of saturated fat -- 10 percent of the daily value for saturated fat based on a 2,000-calorie diet. A homemade biscotti might contain 20 g of sugar and 5 g of saturated fat. Calories in biscotti vary depending on the size and type of cookie. A large gourmet biscotti dipped in a thick coating of chocolate has more calories and fat than a small, plain biscotti. For example, biscotti may have as many as 230 calories and 11 g of fat in an individual cookie. Like most sweets made from white flour, biscotti are a low-fiber source of processed carbohydrates containing little nutritional value for the number of calories per serving. For more nutritious snacks that will curb your hunger longer, choose foods with fiber, such as berries, an apple, celery, nuts in small quantities, rye or whole wheat crackers. Snacks that contain protein, such as low-fat yogurt, kefir, low-fat string cheese, low-fat soft cheese spreads, jerky, protein shakes and protein bars provide longer-lasting energy with less impact on your blood sugar than foods high in sugar and white flour.